Video has a huge potential role to play in the educational experience of our students. Video would appear to offer some unique affordances that should add real value to our students’ educational experiences. 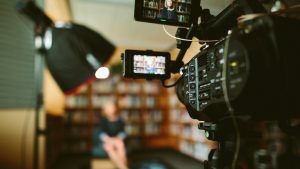 There are many different types of educational video, and also many different contexts in which we can use these most effectively. We will explore some of these below. There are a number of different compositional techniques that can be used in video to provide ways of seeing and understanding visual phenomena not normally possible. These include overlaying the video with diagrammatic elements, using split screen effects to to multiple viewpoints simultaneously, providing key words on screen in text, and by providing explanatory narration to accompany visual sequences. Animations can be used to visualise phenomena in different ways. For example, very complex or detailed data can be simplified in order to make it more understandable, and patterns or trends can be displayed that might otherwise be masked. Animations can also be used in helping to abstract concepts and make them more concrete. Changing the passage of time or physical scale. Video can also be used to speed up or slow down the passage of time, and this can be used to help see things that happen either too slow or too fast in real life to be readily observable. The same can also be said of scale – video has the potential to reduce in size that which is too large to see clearly, or magnify that which is too small to see at all. Instructional videos are typically those that demonstrate an actual process, often accompanied with an explanatory voice over narration. These could be laboratory, field or other sorts of practical techniques that students need to master as part of their learning, or establish important pre-requisites before undertaking an activity. Video can enable the viewer to see things that they otherwise would not be able to see. This might be because in real life they are too dangerous, or too inaccessible for a variety of reasons. They can also provide a unique perspective such as an aerial shot over a landscape to show things in their wider context. Video can also be used to capture special events that may be one-off or very rare. These could include a visiting lecturer or special guest , or the incidence of something that is normally very uncommon, such as a patient presenting with a rare disease. Bringing alternative voices or perspectives into the classroom. In many disciplines, we are asking students to consider and evaluate multiple, and sometimes conflicting interpretations or viewpoints around a topic. Bringing the voices of different perspectives can enable students the opportunity to compare these very readily. This is often achieved by using interviews, and editing these in such a manner as to juxtapose these differing viewpoints. Motivating viewers to learn more. Video can be extremely powerful in providing basic motivation to students to engage with a topic. This might typically be achieved by having a presenter to directly address the viewer, and have them make more of a personal connection with them compared to a written text.